We know many examples when VGI data (e.g., OpenStreetMap, Wikimapia, etc.) help to cope with effects of various humanitarian disasters all over the world. The reason of using open crowd-sourced data is clear. The geographic data are available for free. If, for some reason, data are missing for a specific region, it is not a problem. Necessary geo-data can be even delivered by volunteers in few hours/days, right after an unpredictable hit of a natural disaster. Over years our research group collaborates with humanitarian organizations such as Doctors Without Borders (MSF), British and American Red Cross, the Humanitarian OpenStreetMap team (HOT) and hosts workshops and courses for disaster mapping with Volunteered Geographic Information. 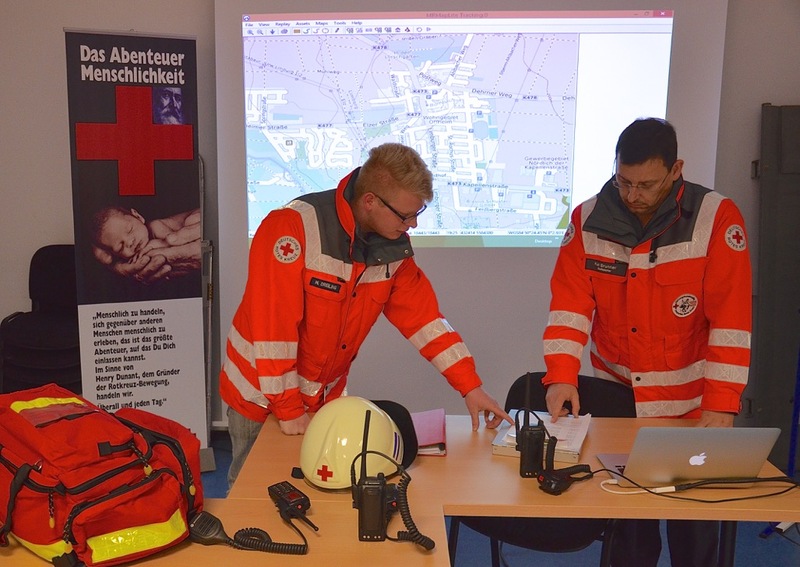 Recently, we received a request from a rescue team of German Red Cross in Limburg a.d. Lahn to support their search and rescue activities with a digital map based on OpenStreetMap data. The requested map should be compatible with MRMap software, which has been tested by the mentioned team for the purpose to be used in trainings and field operations. Note, MRMap is free software for Mountain Rescue in the UK and Ireland and is used for tracking MR personnel during training and callouts. This software is used by over 50 Rescue Teams across the UK and Ireland. Our task was to generate tiles for MRMap in a specific format and in custom projection which is different from a well-known Spherical Mercator. To perform our task, we made use of advanced MapSurfer.NET framework. More exactly, we wrote a plugin that is able to generate MRMap tiles for any map designed in MapSurfer.NET Studio (see figure below). This extension let us to prepare maps for MRMap for any scale and region in the world. Therefore, if you are interested in trying MRMap out in your rescue team, but you don’t have a good digital map or you don’t want to pay the fees for software or geo-data provided by commercial companies, then you can use OpenStreetMap data and MapSurfer.NET framework to design and render your own custom maps. In particular, for the rescue team from Limburg a.d. Lahn, we prepared a cartographic product using a map style from OpenMapSurfer. 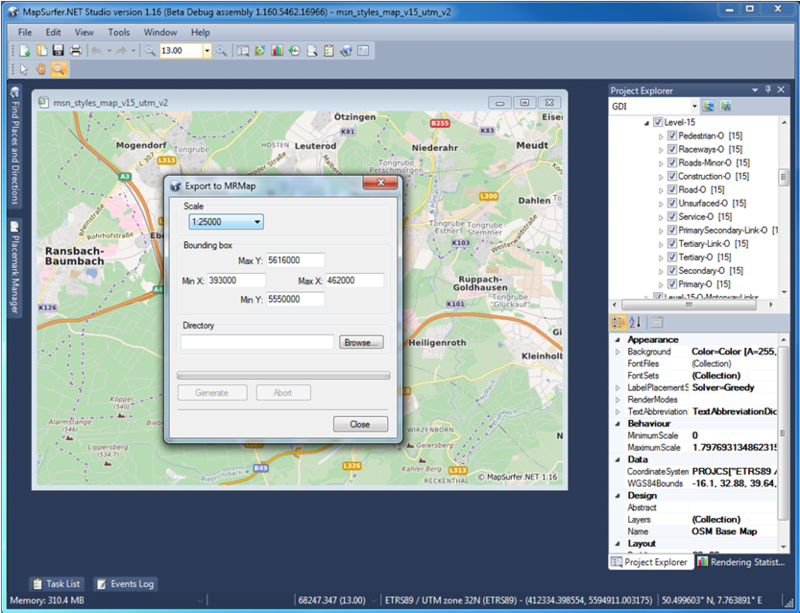 An element of a user interface in MapSurfer.NET Studio. Have you ever thought that your contribution to OpenStreetMap can save somebody’s life? It might be that right now somewhere a search and rescue team uses your contributed data to search for missing or buried people. Do not put off your mappings till tomorrow, sign up and make your contribution to the OpenStreetMap project. It does not matter whether you will contribute a road segment, a building or a POI. Everything is essentially important and valuable, because nobody knows what will help those brave rescuers (see image below) to do their job in a certain situation. Members of a rescue team at work (Rettungshundestaffel Limburg DRK KV Limburg e.V.). Team, thanks for your great work on this project ! According to my opinion, “The geographic data MUST available for free” and your work is just great. You serve a very good service. Congratulations!